The tragic story of Romeo and Juliet is a legend, nobody can tell if the two unlucky lovers of Verona ever lived. Nevertheless, like in every legend, there are many elements of the story that have references to real places and historical facts of Verona. For example it is history the bloody struggle between Guelphs and Ghibellines, the pope party and the emperor party, the two factions fighting, not over religion but over secular power. In the middle age, families belonging to one faction or the other, although living in the same town, feuded ferociously. The Montecchi family (Montague in the English version) really existed in Verona, and lived in that sort of middle age fortress which is now considered Romeo's house. The high walls of the building are characterized by the peculiar "swallow tail" battlement symbol of the emperor party. Dante, who belonged to Ghibelline faction, fleeing from Florence, a Guelph town, found hospitality in Verona at the time in which the events are thought to have happened, under the rule Bartolomeo della Scala lord of Verona. In the Purgatorio, Dante wrote few mysterious verses about the two families Montecchi and Capuleti (Montagues and Capulets). Shakespeare wasn't the first to write about the sad story, he based his tragedy on some Italian versions (especially those by Luigi da Porto and Matteo Bandello) quite popular in Italy and Europe at that time and that were probably based on some kind of oral tradition. In all these versions can be found references to historical facts and characters, places and buildings so that through the centuries, tradition has identified some city buildings with the places where the story took place: Juliet's house (with Capulets family crest), Romeo's house, the 13th century gate through which Romeo left Verona in exile, Juliet's tomb, in the only existing monastery outside city walls at that time. All these places can be visited with a specific guided tour, and on many of them are attached plates or inscriptions, recalling the tragic events. 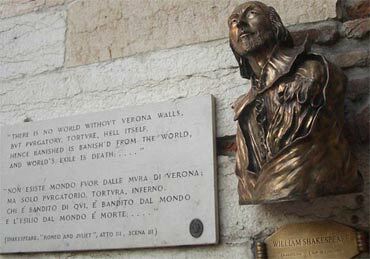 The Shakespearian places in Verona can be visited with a special guided tour following all the historical references to the story.